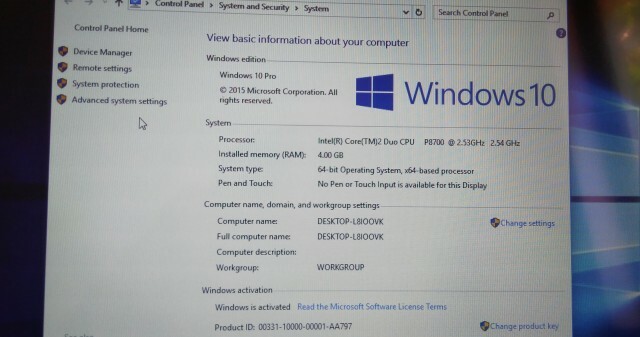 Laptop militar refurbished import SUA Made in Mexic (NU este CHINA) foarte rezistent la socuri, praf, apa ideal pentru service auto = > Dell Latitude E6400 XFR. 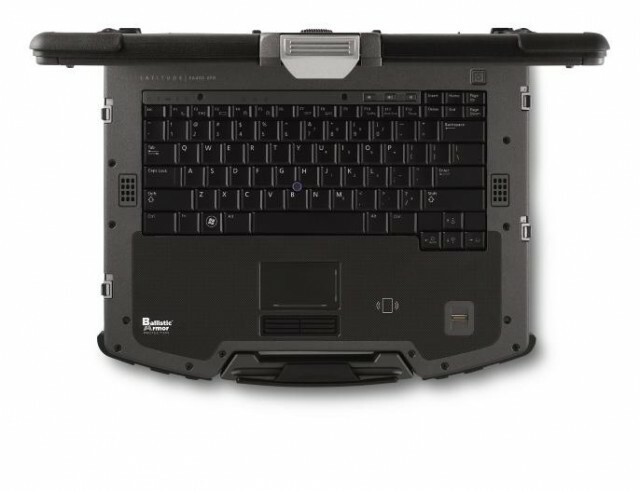 Este similar cu laptopul militar Toughbook Panasonic CF19 insa acest model este de generatie mai noua, un procesor si o baterie mai performanta precum si cu un display de 14.1 inch cu Touchscreen activ/activabil. Aceste aparate provin din armata SUA, calitatea este una deosebita, functioneaza ireprosabil. Este de mentionat ca primim loturi diferite din SUA, unele dintre aparate sunt in stare excelenta, altele insa pot avea urma de uzura dar fiind in stare de functionare foarte buna. Nu toate aparatele dispun de touchscreen activ/activabil, unele loturi au aceasta optiune, altele nu o au. STOC LIMITAT !!! SE LIVREAZA IN 1-3 ZILE !!! Rugged business notebook, based off the standard E6400 with a new chassis built around the same internal components to make it rugged and waterproof. The chassis offers completely dust and weatherproof access panels covering all external ports, rubber bumpers, and a built-in carrying handle for easy transport. One area that Dell stands hand and shoulders above other rugged notebook manufacturers is the inclusion of high-end components, including dedicated graphics, instead of taking a low-voltage and low-heat approach. 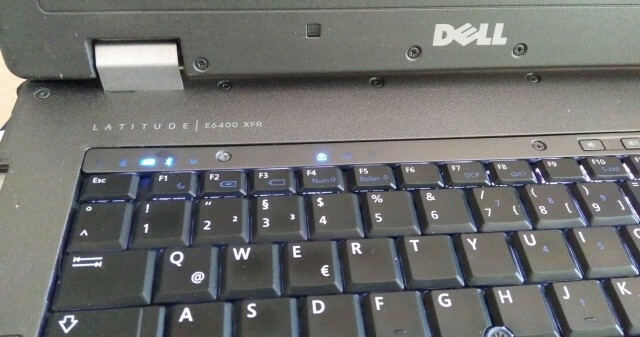 In this review we put the Dell E6400 XFR through a battery of tests, to see how well it stands up against other fully-rugged notebooks. 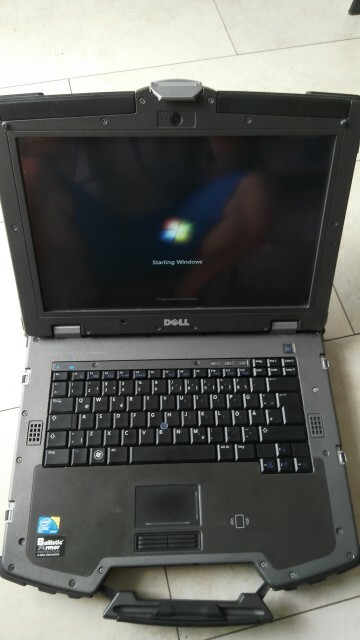 If you could imagine a Dell Latitude with a huge shell of thick plastic and alloy bolted around it, that is the best way to describe the Dell E6400 XFR. Dell took the same hardware from the business line of notebooks and put it in a redesigned chassis to hold up to the rigors of heavy-duty usage. 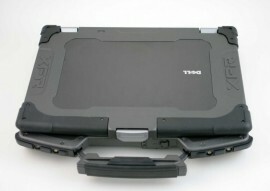 To the average person the Dell XFR might not look stylish or pretty, but that isn’t the point of full-rugged notebooks. Outside of the color scheme the entire design is a matter of function over form. The body panels are molded with internal bracing for enhanced rigidity, the corners are covered with rubber to absorb energy from being dropped, and it even includes built-in handle for easy transport. Build quality is above and beyond a standard Dell notebook thanks to very tough body panels and super strong screen hinges. To open the notebook you need to release a metal clip that holds the screen shut … even if you accidentally drop the notebook down a flight of stairs the screen lid won’t open. The rubber bumpers are securely attached to the chassis and there’s no hint of them wanting to pull or peel off. The built-in handle is designed as part of the chassis and include durable collapsing hinges that let the handle fold in when it is not in use. The only part of the chassis that I think could have been improved is the air vent on the bottom of the XFR, which is made from thin plastic. It flexes more than we would like to see on any notebook, standard or rugged, creating a weak point in an otherwise fully-rugged design. The Dell E6400 XFR is built to withstand adverse operating conditions, which may include getting caught in a rainstorm, dropped off the back of a truck, operating in a bumpy car, getting stuck at the North Pole, or even running in a desert. Drop conditions are tested from four feet onto a plywood covered surface, to simulate someone dropping it from about waist height. For extreme temperature tests the XFR is rated up to 145 degrees Fahrenheit, and as low as -20F while running, to simulate desert or winter conditions. In our review we tested the lower operating conditions in our kitchen freezer, weather test via water splashed at the XFR while running, and drop tests onto our office floor. In every test the XFR performed as expected, and kept running without problems. With many rugged notebooks spending a good portion of their time outdoors, the E6400 XFR offers a sunlight-readable WXGA panel with optional touch-sensitivity. To limit the amount of glare, the screen is a matte finish style, but has more “sparkle” than most matte displays. Colors and contrast are below average at higher brightness levels and the backlight bleeds through at higher levels. For many high-brightness LCD’s this is very common, although the high-brightness T400 didn’t suffer from this as much. The panel felt stronger than most notebooks thanks to a hard front surface, but still suffered from color distortion under mild pressure from touching the panel. In contrast, the Getac B300 rugged notebook offers an impact-proof panel, which can take a direct punch without showing any signs of color distortion. At the highest brightness setting the E6400 XFR screen was easily readable in full sunlight, with comfortable home viewing brightness somewhere between 30-40%. Viewing angles were above average, with a broad vertical viewing sweet spot before colors started to shift. Speaker performance is average for a rugged notebook, where they work fine for streaming music or VOIP. Bass and midrange support is lacking, leaving only higher frequencies coming through. Overall volume is decent for a small room, but headphone would be a better option for privacy and higher audio quality. The keyboard on the E6400 XFR is ruggedized as well, but has the look and feel of a standard notebook keyboard. It is comfortable to type on, with only a light touch needed to activate each key. The key surface is mildly cupped, which can help center your fingers if you are typing with gloves or very cold hands. For typing in dark conditions, the keyboard is fully backlit with white LED’s showing through the bottom. The backlit appears to be non-adjustable, with settings only for off, on, and automatic. Noise while typing is minimal, with a muted click given off when a key is fully pressed. The touchpad is recessed into the palmrest, allowing it to be fully weather-sealed against dust and water intrusion. The touchpad surface is very responsive and has minimal lag in our testing. The surface texture is a rough matte finish, providing enough traction for accurate movement but still easy enough to use if your fingers are wet. The touchpad buttons are covered in rubber cladding, allowing them to have a full range of movement, but remain sealed against the elements. Feedback is surprisingly good, with a long throw distance and a soft click when pressed. Pressure needed to activate the buttons is above average, but not too much to strain your fingers over time. All external ports and expansion slots are sealed from water and dust with solid hinged panels, with frequently used ports offering sliding access panels. In terms of ports the E6400 XFR is fully loaded with three USB, one eSATA/USB combo, LAN, DisplayPort, VGA, FireWire, audio jacks, and a legacy PCMCIA slot. Dell also includes a front-mounted SD-card slot with its own little access panel behind the carrying handle. Compared to other rugged notebooks the Dell E6400 XFR is one of the fastest we have reviewed. 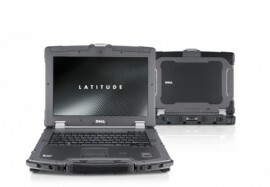 While other rugged notebooks tend to go with low voltage processors and integrated graphics, Dell packed an Intel Core 2 Duo P9600 processor and NVIDIA Quadro NVS 160M dedicated graphics. This allows the E6400 XFR to perform at workstation levels, letting you run more intensive applications out in the middle of nowhere. The only big downside to this approach is less battery life and increased heat, but if you need the speed, you don’t have any other choice. For day-to-day tasks the XFR is quite fast with the 128GB SSD, and with the dedicated graphics you can even lightly game if you are so inclined. If you want to serve up 720P or 1080P video in the middle of a forest, the E6400 XFR can easily cope with the load without any hint of lag. 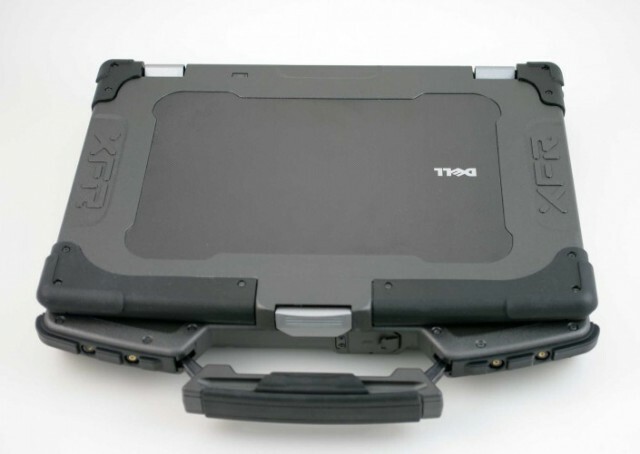 Bottom line is that the XFR is the fastest rugged notebook we have seen in our office. *All 3DMark06 benchmark tests are set at 1280 x 800 screen resolution. With most rugged notebooks heat and noise is not much of a concern … since they usually offer low voltage processors and integrated graphics. Our review Dell E6400 XFR review unit included an Intel 2.66GHz processor and dedicated NVIDIA graphics, which kept system temperatures high during the stressful periods of our tests. The cooling system is partially sealed on the XFR, whereas some rugged notebooks are completely passive-cooled. Dell mounts a heatsink and fan underneath the notebook in a sealed chamber exposed to the elements. This allows higher heat loads to be air cooled through a channel of heat pipes. The only problem we found with this is that under higher loads the fan noise was very loud–above most gaming notebooks. Under normal light usage fan noise was not a problem, only when the system was gaming or decoding multiple HD-videos did the fan become disruptive. The Dell E6400 XFR offers a standard 6-cell battery, with an optional 12-cell slip-on all-day slice battery. In our tests with the E6400 XFR using the 6-cell battery, with Vista set to the “Balanced” power profile, screen brightness set to 40%, and wireless active the system stayed on for 3 hours and 44 minutes. Normally we test at a higher brightness, but with the high-brightness screen we tried to match standard notebooks in the overall brightness level. 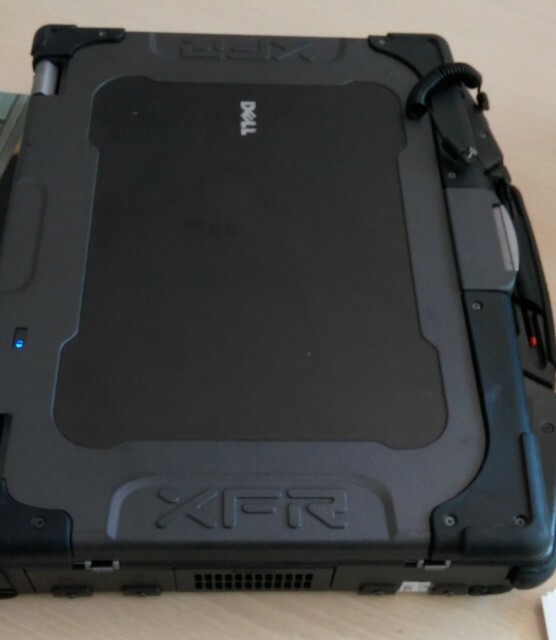 Compared to other rugged notebooks we have reviewed like the Getac B300 the results were less than impressive, but the Dell XFR includes much higher-end hardware that demands more power.